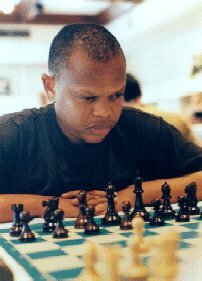 The following 1998 interview with South Africa's IM Watu Kobese was translated from Notzai (www.notzai.com), a French language chess site. In this interesting interview, Watu talks about his father's chess influence, his tough decision to turn professional, and his subsequent struggles to earn the coveted GM title. One of Africa's strongest players to date, IM Kobese is a several times South African champion, and has represented the African zone in the FIDE World Championship Cycle. He spent 3½ years in Germany and played in strong tournaments throughout Europe. He has also played successfully in the United States. How did you begin with chess? I started to play at four years of age. My father's friends met regularly at our home to play (Editor's note: Watu's father Arthur Kobese is the current South African Chess Federation President). I started to play in the tournaments at school and was eight when I played in my 1st tournament. At the time, of course, one could not play abroad (Editor's note: This was due to sanctions against the apartheid government.) It is only beginning in 1992 that one could play at the international level. In 1989, I obtained a purse to go study chess in Germany. In a tournament in South Africa, I had drawn against German GM, Ludek Pachman, and I had just won five tournaments in a row in South Africa. . . I had improved. Thus, I obtained the purse. I remained 3½ years in Germany, where I studied with Ludek Pachman and GMs Miroslav Filip and Lothar Vogt. They emphasized how it was necessary to study. And I played in my first international tournaments. When did you decide to become a professional player? I studied the economics (of the situation). I did this for two years and it really annoyed me. Then I established a plan: first, play in the Olympiad; obtain the best score to qualify for the zonal, then the interzonal. I started to prepare myself and finally, I succeeded in carrying out what I wanted; I became a professional player, but for me, it's not a question of money. The money. . . it's good obviously, but for me, it's not a question. I could even live off of bread and water, as long as I can play against strong players! Certain people say to me that I am completely insane to have chosen this profession. I believe that I was 2200 ELO when I made this decision. . . it was foolish! One said to me, "You will be able to survive, and you will be able to become a Grandmaster." At this moment, I am in a difficult position. I'm trying to obtain the title of GM, but I'm under pressure because I must play to obtain results, to gain points, and get the norm. In many tournaments, I missed the norm by very little. . . I needed ½ point, or a point out of two rounds, but I lose both. Yet I am convinced that I will obtain the title. . . it is a question of will. You know, sometimes I play really well! But sometimes I become completely foolish. I'd have good positions, and fall apart! Currently, for example. . . I played in tournaments after having played in the World Championships. I had earned money, then I played in Europe: Groningen (in Germany), Capelle La Grande (in France). . . and I played well, but I missed the norm. Then I played in the United States, but I did not have enough money. It's very expensive. What is the situation of chess in South Africa? The problem in South Africa is that we do not have a Grandmaster yet. The government grants support, in any sport, only when it offers a possibility of propaganda. . . publicity. For chess, it is necessary that one has a GM to attract attention. I do not play in South Africa because there's not much competition (world class tournaments). . . I play only in tournaments abroad. . . sometimes. And that is expensive. Thus, in fact, I do not have much practice. Of course, I would like to continue to play, but it is very difficult, financially. I had a proposal for a sponsorship. . . a computer firm. They would finance my tournaments, but they never have sponsored anyone unless they are working there.